Researchers at the National Oceanography Centre (NOC) have developed a new, automated method for classifying hundreds of kilometres of the deep sea floor, in a way that is more cost efficient, quicker and more objective than previously possible. Currently there is very little information about the geographic distribution of life on the sea floor. This is largely because of the practical difficulty in accessing creatures which live at such a great depth in the ocean. However, this research soon to be published in the journal Marine Geology, reveals a new method of estimating this distribution using a combination of: submarine mapping technology, statistics and a ‘landscape’ ecology technique called ‘Niche Theory’, which is generally used on land. The Niche Theory states that biodiversity is driven by spatial variability in environmental conditions, i.e. the greater the range of habitats, the greater the biodiversity. The lead author of this study, Khaira Ismail from the University of Southampton, has used this concept to create broad-scale, full coverage maps of the sea floor. The objective of these maps is to estimate the location of biodiversity hotspots, by identifying areas where the deep-sea landscapes are relatively more varied. Bathymetry map of Lisbon–Setúbal and Cascais Canyons offshore Portugal, overlain by TOBI sidescan sonar imagery coverage. Contour interval is 500 m.
The inset map shows the location of the study area relative to the location of Portugal. These maps cover areas approximately 200km across, and have pixel sizes around 25m. They are created using information on the topography and sediment type of the sea floor, collected from a multi-beam echo sounder and a side scan sonar, respectively. 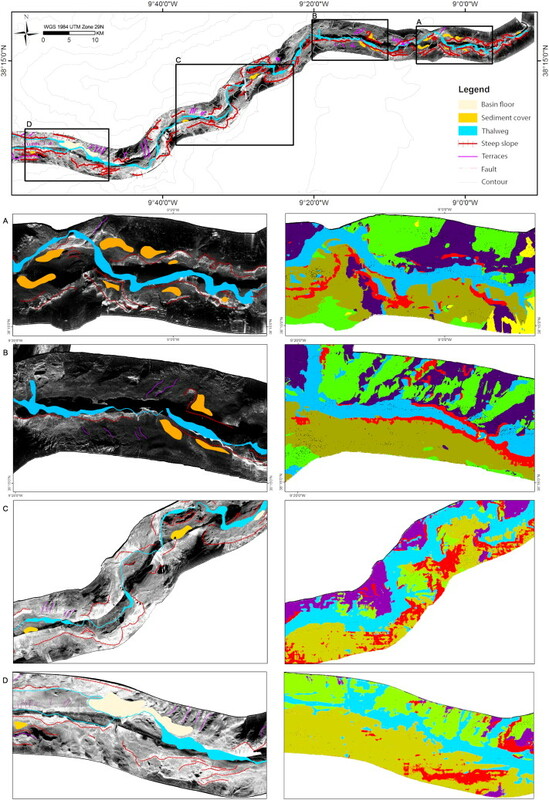 The resulting map is then analysed in order to break down the sea floor into a series of zones, using statistical analysis to identify distinct ‘geomorphological terrains’ in an objective and repeatable way. 3D views of the Portuguese Canyons from south. 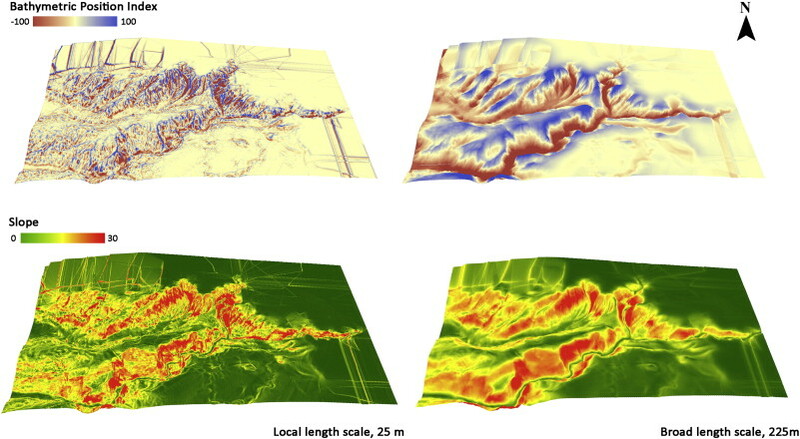 The figure shows variations of bathymetric position index analysis (top) and slope analysis (bottom) resulting from using two different length scales. The local length scale is 25 m (initial pixel size) and broad length scale at 225 m.
Note the different features delineated at the different analysis scales. Results from local length scale contained detail features but noisier whereas broader length scale shows the gross canyon morphology. Khaira said “using statistical methods to identify these ‘terrain zones’ allows us to be more objective than if we were picking them out by hand. 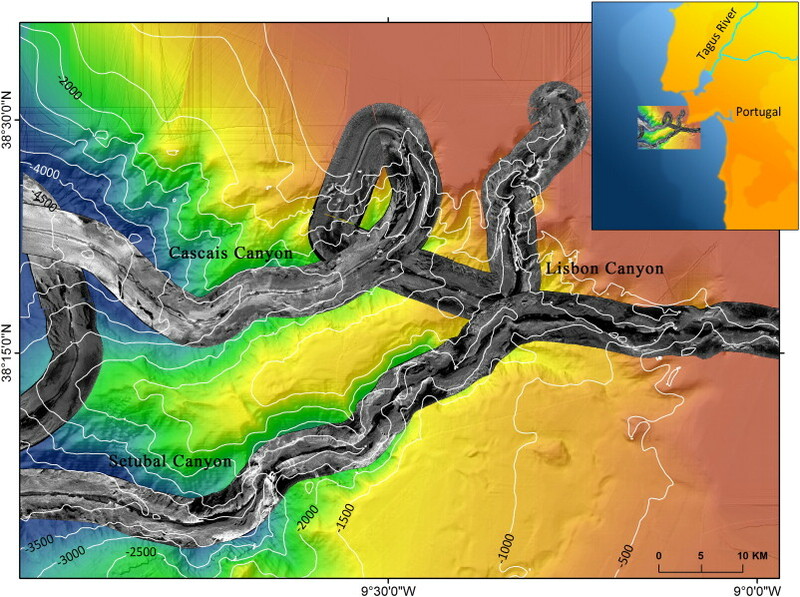 An expert visual interpretation of Setúbal Canyon from sidescan sonar imagery collected in 2005 used for visual comparison with automated marine landscape map. A, B, C, and D are zoomed figures of the visual interpretation map from sidescan sonar imagery (left) in the selected area (outline in black) compared to automated marine landscape map (right). The expert interpretation in this area lacked contiguity and coverage, although manual delineation allows individual features to be picked out there is always a possibility of it being missed due to human error. In comparison, the automated technique produced a more consistent map but often too generalized (i.e. : small features are often grouped together). This research forms part of the €1.4M European Research Council funded CODEMAP project, and was applied in the Lisbon-Setúbal and Cascais Canyons, off the Portuguese coast. These submarine canyons were classified into six marine ‘seascapes’, based on their geomorphological features. Future work will use submarine robot cameras to take photos and videos of life in the deep-sea areas that have been subjected to this mapping technique. This will allow researchers to start to identify new deep sea habitats.